The story of ESN Niš starts on November 2014. when two girls held a presentation at the University of Nis to a group of students who happened to be there without having an idea that it was a beginning of a life changing story. The students had no previous knowledge on what the presentation was going to be about, and they thought it was an explanation of ongoing student exchange programs. Although it was a total surprise, how cool was an idea to actually be able to make friends from all over the world and help them manage the new life in our city? Few months later, ESN Serbia had gotten a third section, the smallest but full of enthusiasm - ESN Niš. 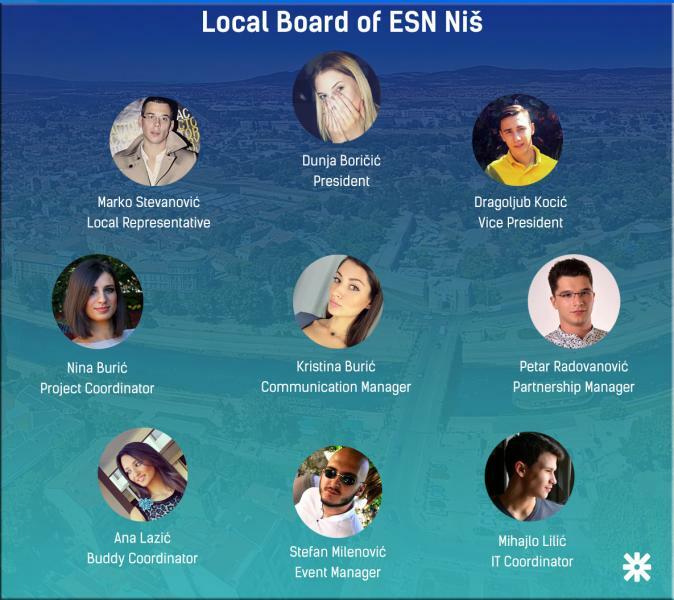 The founders of ESN Niš were eight students, who gave their hopes, dreams, ambitions, time and effort to establish one more section of this beautiful student organization that is growing each day. Without any skills in this field, they have managed to develop the exchange program in Niš and pass on the knowledge they have obtained during their work in the organization. Since then ESN Niš had so many events and so many people involved in them. The interest to be a part of this network and a part of ‘students helping students’ moto, has increased to a great level. The current local board has 9 members and two initial founders of Erasmus Student Network Niš are still a part of it. The hardest part since the section was founded was and remains - passing the knowledge to younger members and maintaining the level that has been set. The section Is blessed by great young people who work every day, and all the other members are giving their best and pursuing new ideas daily. The board is going to change each year, but the spirit of ESN Niš will stay the same.